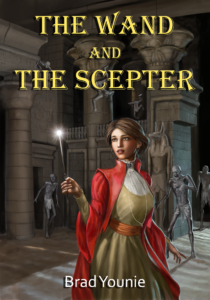 Come one and all to Wattpad to read my new novel, The Wand and The Scepter. It’s a fun novel about a witch who goes on an adventure to Egypt in the 1860’s to search for a lost city and gets more than she bargained for. The book has action, mystery, suspense, romance, and enough Harry Potter-ish wonder to make anyone happy. You need to have an account on Wattpad to read the book, but it’s free and easy to do. Just go to http://wattpad.com and create an account. Then, you can either search for me, Brad Younie, or for The Wand and The Scepter and start reading. If you are unfamiliar with Wattpad, you can either read books using the website or get the app for your phone or tablet. As is normal on Wattpad, the book is being added in serial format, with one chapter being added each week. I will post every Friday afternoon, without fail. You can follow the book to get notifications when new chapters are added and when existing chapters are updated. Add the book to your Library to have easy access to it. And, of course, Vote for each chapter. Voting is just a toggle, so it’s the same as Liking. If you like the chapter, then vote on it to let me know. Most of all, have fun with the book. I had a blast writing it, and I hope you have a blast reading. And here’s the cover of the new novel, The Wand and The Scepter. The book is planned for a release on Wattpad. I’m still editing, but I hope to start publishing in a month or so. The process for getting the cover done was smooth, and Gordon Napier was a great artist. The finished product is fantastic, as you can see, but I was very impressed with his professionalism and the regular updates he gave me, each time asking for my thoughts and concerns. The cover represents a scene from the novel. For spoiler prevention, I will not go into detail about the scene, but I will say a few things about the cover. This is pretty much what I envisioned Perri to look like. She’s the protagonist of the novel and is a Wizarding world witch in the 1800’s. So, she’s sporting a Victorian style dress underneath her red wizard’s robe. I never had a clear image of her face, save for the brown hair and brown eyes, but Gordon’s representation is spot on. The background looks fantastic, and both exciting and eerie at the same time. Of course, in the novel, the creepy-crawlies do not climb on the walls, but it looks great in the image.